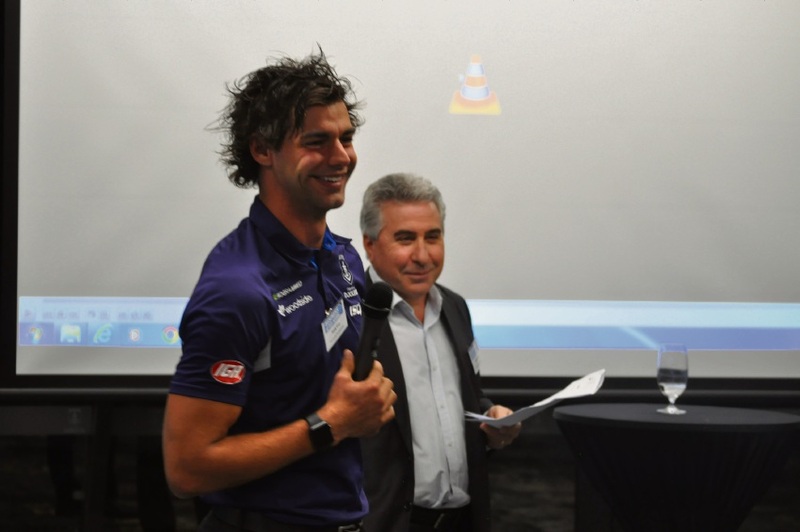 Dockers midfielder Brady Grey with Melville Cockburn Chamber of Commerce president Tony Romano. FREMANTLE midfielder Brady Grey says the Dockers have settled in well at their new base at Cockburn ARC. Grey, speaking at a Melville Cockburn Chamber of Commerce (MCCC) after-hours event recently, said he loved the club’s former home at Fremantle Oval but the facilities were not at the level needed by an AFL club. “The facilities available to the players (at the ARC) are second to none,” he said. “The way the AFL is going at the moment, any per cent we can pick up physically and mentally is going (to help). “We’ve been here for about four months now so the guys are really settled in and enjoying the facilities. For information about the chamber, visit www.mccc.org.au.